People often ask “How can you find your way around all those points of light, and know exactly where to look in the sky to see something?” Part of it is recognizing the constellations, fixed groups of stars that map the sky and, in many cases, look like familiar shapes. It’s a lot like finding a city on a road map. The task is easier if you first find the correct state. Starting at the end of the Big Dipper’s handle, follow the same curving arc until you reach a prominent star. That will be Arcturus, an orange star similar to our Sun, but 36 light years distant. It’s the third brightest star visible from the northern hemisphere. Now “speed to Spica” along that same arc. Spica, a blue giant star 261 light years distant in the faint constellation Virgo, is the 13th-brightest star in our sky. 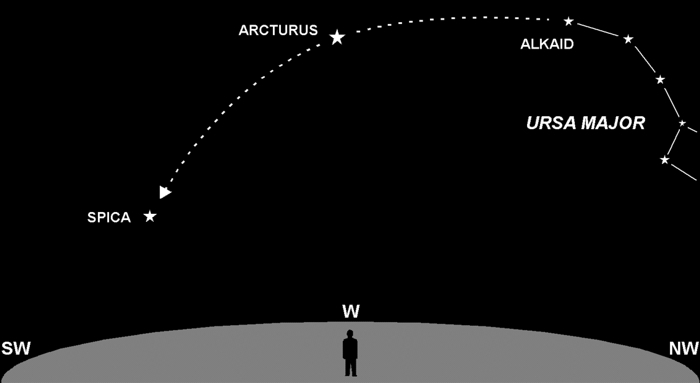 So, if you can find the Big Dipper, you can easily “star hop” to Arcturus and Spica. Remembering all those names and numbers takes a bit more practice. Previous Previous post: Q&A: Pigs Can Fly!